how do i turn on Norton firewall. selections are turned off and grayed out. intrusion protection, smart firewall, browser protection are all turned off and grayed out. can't turn on. 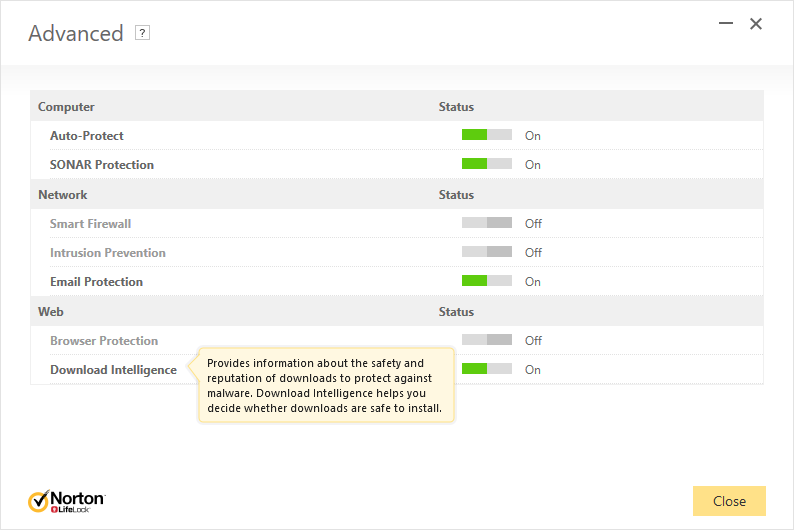 Re: how to turn on norton firewall? This situation often occurs while there is a pending detection removal. Restarting your computer often resolved this. Sometimes you may need a few restarts to complete the detection remediation. Be sure you are using restart and not shutdown and startup again. If you use Windows 8/8.1 or 10, there can be an issue with the Windows Fast Startup feature.. See more information here. All: Just a small note to add, this can also be caused when the user is not logged into the system under an account with admin privileges. How come my reply didn't show up here when I first replied?? Thanks for reporting in Norton Community Forums. Can you please provide below information for further investigation? I had a Norton tech take remote access. Norton was uninstalled and reinstalled, this seems to have remedied the problem. Thanks for the update, @NortonJohn.